Enjoying a cup of healthy bone broth has been around for thousands of years. Chinese medicine dates it back over 2,500 years as being used to support the digestive system, and strengthen organs. What we think of as a fad or new craze, is actually ancient tradition brought back into modern times. Along with so many healing properties (listed below), a good meal of soups, stews, or gravies is brought to an entirely new level of taste bud enhancement with a good broth. When I am sick, this is now my go-to to help me fight the nasty bug and boost my immunity. I just fill up a mug, heat it up and drink 2 cups a day until I’m feeling better. Improves gut health by aiding in digestion, soothing digestive upsets, and help alleviate painful gas and bloating. Supports and boosts immunity, which helps prevent colds and flus. Also great to drink while you have a c cold of the flu due to its immunity boosting properties. Great for your hair, skin and nails because of the collagen. The collagen also helps to heal your gut lining and reduces intestinal inflammation. I recommend using a slow cooker because this process is long. To really get the nutrients pulled out of the bones, it should simmer for at least 12 hours. I had mine simmering for 18 hours. You can drink the hot broth on its own or use it to make your soups and stews. Place all ingredients into a slow cooker. Add water until chicken is almost covered. Leave a bit of room to ensure the water doesn’t flow over because it will raise up during the cooking process. A couple of inches will suffice. Turn it on low and let cook for at least 12 hours. About 30 minutes before turning off heat, stir in the parsley. Once ready, allow it to fully cool. You can even just place it in the fridge to cool until you are ready to clean and strain. If there is a layer of fat that forms on top after it is cooled, just scoop it off with a spoon and throw it away. 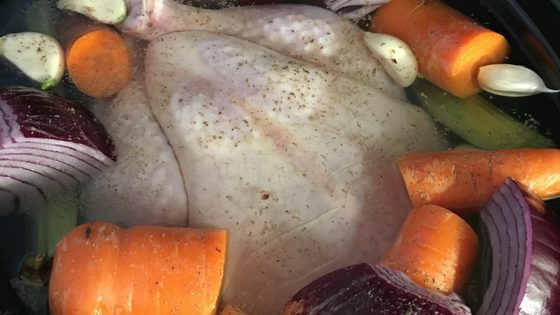 Remove the chicken and clean off all the meat that you are going to want to eat and store in an airtight container either in the fridge or freezer for later use. To strain, place mesh strainer (or cheese cloth) over a large boil. Strain until all the liquid is in the bowl. 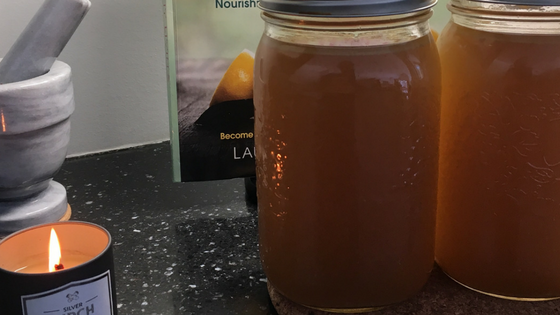 Then you can divide the broth into mason jars and store in the refrigerator for up to 2 weeks, or place it in individual use containers and store it in the freezer for months.